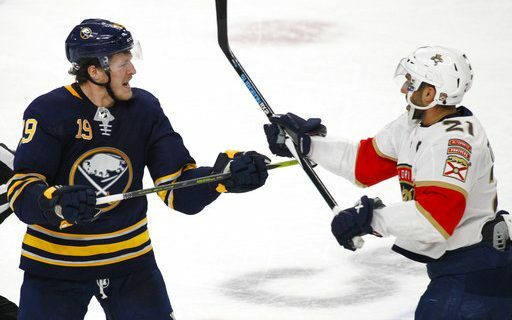 The Buffalo Sabres in one sense might have deserved a better fate than a 4-2 loss to the Florida Panthers on Thursday night at the KeyBank Center. They had the better of the play for a majority of the game, and gathered some momentum as the contest went along. Good things usually happen in such situations. But not to the Sabres, not this season. Buffalo started slowly again, even when it took a 1-0 lead on a power-play goal by Ryan O’Reilly. About three minutes later, Johan Larsson and Marco Scandella entered the penalty box seconds apart. Keith Yandle got the goal back in short order for the Panthers. A few minutes later, the Sabres were caught with too many men on the ice. Less than a minute after that, Mike Matheson made it a 2-1 Florida lead. And after Denis Malgin made it a 3-1 advantage, one of the smallest crowds of the season (announced at 16,707, with plenty of no-shows) made its displeasure known at period’s end with some boos. From there, the Sabres looked more like the team that had won three straight in Western Canada last week. They had the edge in play, especially after Girgensons came up with a short-handed goal early in the second period. There was one four-minute stretch where the Panthers couldn’t even get the puck over the red line. Then in the third period, the Sabres kept pushing. They had about three very good chances from the slot, only to miss the net. Evander Kane – who hasn’t scored a goal in a month – had one such opportunity, and we’ll no doubt be thinking about it during idle times until the next game. By the time the last three minutes rolled around, Buffalo had to take some chances in an effort to tie the game. Instead, the Panthers took off on a two-on-one break. Colton Sceviour flipped the puck past goalie Chad Johnson to wrap matters up. A save would have kept Buffalo’s hopes of getting to overtime, but crucial plays like that have been scarce around here. Some of the week’s frustration boiled over in the final couple of minutes after Sceviour’s goal, with several different scrums. Larsson picked up a match penalty, which means his cross-checking penalty will be reviewed by the league for a possible suspension. Kane earned a rare five-minute interference call. Whether the extra-curricular activities were a case of honest emotions coming out or simply the reactions of a frustrated team to another loss remain to be seen. That upcoming contest will be back in the KeyBank Center on Saturday night against St. Louis. 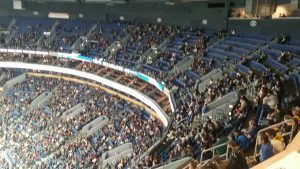 There was considerable talk about Tuesday’s game about Buffalo’s inability to play well at home. So I crunched some numbers to see what was going on. First things first – I looked all of the NHL teams before Thursday’s games and compared points earned at home to points earned on the road. The Sabres indeed had the worst record in the league in that sense. Buffalo had picked up 15 points at home and 22 on the road. What is striking is just how many teams are “underwater” – have more points on the road than at home. The list includes Arizona, Vancouver, Edmonton, Carolina, Calgary, Chicago, Los Angeles, Toronto, and Tampa Bay. Way back when I did this stuff for a living, that would be a lot. Usually two or three teams might be better away from home in the 1990s. All right, I can hear you from here. The Sabres had played 22 games at home this season, and 28 on the road. That might be part of the issue right there. Let’s look, then, at the percentages. The Sabres had picked up 15 of a possible 44 points. That’s a percentage of .318 – not too good (and it dropped a little after Thursday). The team was 22 of a potential 56 on the road for a percentage of .393. 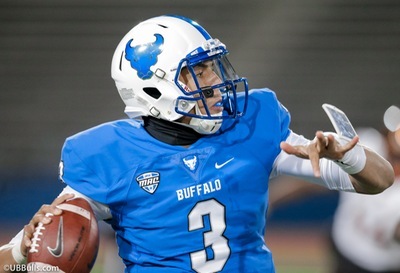 Therefore, no matter how you look at it, Buffalo has been better on the road. Then again, Vancouver had even bigger split for home/road percentages. The Canucks play .420 hockey at home and .500 on the road. The champion in this area, though is Calgary. Here are some numbers that make little sense. The Flames are at .500 at home and at .673 on the road. Calgary had played four more games at home so far. You’d have to think the Flames’ numbers will even out at some point. I’ll make one last point about the Sabres, discovered while looking around the stat package. Entering Thursday night, Buffalo had been outscored, 44-22, in the first period in all games this season. Yet in that period, the team had outshot its opponents, 513-505. In other words, the Sabres were shooting 4.3 percent in the first period; opposing goalies were stopping 95.7 percent of their first-period shots. In other words, they were making netminders look better than Dominik Hasek (about a .930 save percentage in his prime) every night in the opening 20 minutes.